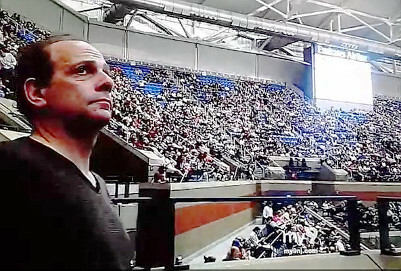 TV Appearance: Inside Edition, UPN9 NYC - "Deafening Noise at US Open Tennis Tournament"
Program Aired Wednesday, September 7th, 2016. Steven Sabian, Reporter. 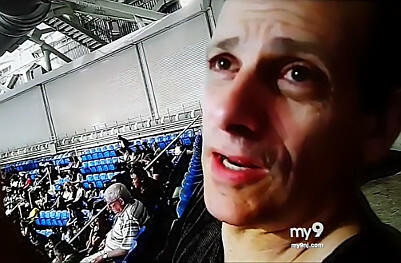 After reports that the addidion of a retractable roof at Arthur Ashe Stadium had resulted in noise so loud that it was distracting the players, the TV program Inside Edition asked Alan Fierstein of Acoustilog to attend a match and appear on the show. The roof is closed in rainy weather, but then the rain itself becomes a source of noise, as Al explained. "It's like little drumsticks - millions of them - beating on the roof of the stadium". Furthermore, the roof helps to keep the spectator noise in. Al likened it to a Roach Motel. "...the sound goes in, but it doesn't come out". He added, "It's so loud, that even when the ball is in play and the players have to be concentrating, there's a constant din from even the murmuring of the spectators". 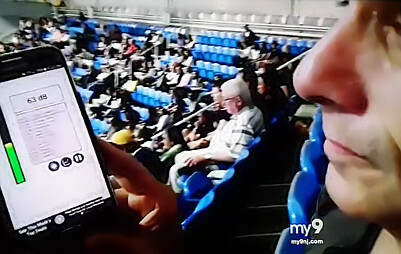 Please note: One of the photos shows Alan Fierstein using a cell phone app to measure the noise. Cell phones are not suitable for measuring noise accurately (click to read more) and he does not use them. In this case it was necessitated by the US Open rules about what may and may not be brought into the stadium.